It's been over three years but boxing fans are finally going to have the chance to see Ricky Hatton fight again when he takes on Vyacheslav Senchenko in Manchester. The pair fight on Saturday November 24th at the Manchester arena, pretty much the only arena big enough to hold a Ricky Hatton fight. Keep reading to find out how you can attend. Hatton retired following big losses to Floyd Mayweather and Manny Pacquiao*. We all know there is no shame in losing to two of the best welterweight boxers ever, but the Pacquiao loss in particular screwed Hatton up, and it looked doubtful we would ever see the Mancunian fight again. By all accounts he is now in the shape of his life and he wants to fill the enormous hole that boxing left behind. Tickets went on sale a few weeks ago and were promptly snapped up by touts (something needs to be done about them), but there are still some decent seats left at good prices. Seatwave have loads of tickets that start from £77 and range up to £1000 if you want to sit ringside. Q - Who is fighting? Q - When is it? Q - Where is it? Q - Where can I get tickets? There are some still available from Seatwave ranging from £77 to £1000. Touts at the arena will try to charge you far more. 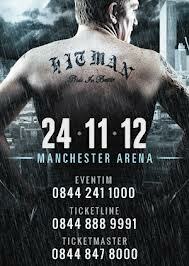 Click here to see Seatwave's Ricky Hatton vs Vyacheslav Senchenko tickets. Ticketmaster also have tickets starting from £45.80, go here to see them.